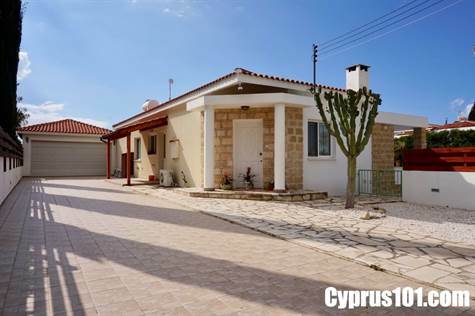 Coral Bay, Paphos - This charming bungalow is located in a private and peaceful setting on a cul-de-sac in Coralo Hills overlooking Coral Bay. You will enter your home through a private, electric gate and a long finished drive that can accommodate up to 5 cars plus a 2 car attached garage that leads directly to the kitchen. The large plot has a well landscaped garden, automatic irrigation system, 11 x 5 square meter pool, pergola with a BBQ table and a large rooftop terrace with breathtaking views of Coral Bay, Paphos coast and the Mediterranean Sea. This 3 bedroom bungalow is perfect for a family, holiday home or as a an investment. You need to see this property in order to really appreciate its' fine qualities from the open and airy living room, the elegant dining room with the open kitchen to the large master with en-suite. This home has it all!